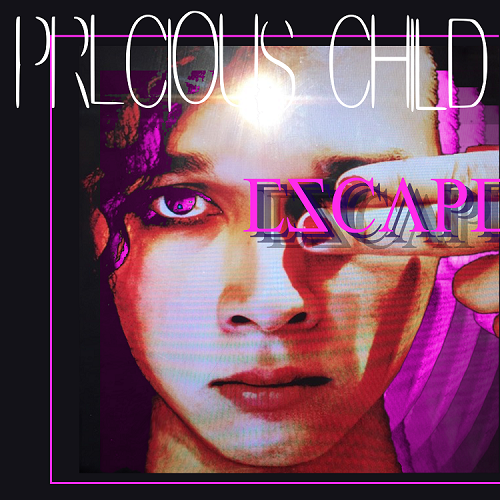 LA Based Electronic Industrial Composer and Producer Precious Child may be known for his Dark Rock sound, but his newest LP, ESCAPE, with tracks from the score for the Neil Gaiman biopic Dream Dangerously, showcases the enigmatic artist’s phenomenal range. If you haven’t, already, listen to the album (below) and take a read through to get the background and what’s next in the world of Precious Child. First things first, thanks for sitting down with us today! Outside of the new album, what has been going on in the Precious Child world? Hey thanks for reaching out. First of all I [Precious] moved to LA in fall 2015. The art and music scene here is incredible, with so many talented and inspiring individuals creating massively culturally impactful work. I had to get immersed in it. I amicably parted ways with my drummer Skyler and bassist Billy who wanted to stay in Maryland to be close to family and friends. A new LP concept album is in the works with the demos completed and recording for that should begin shortly. That LP will be released in 2017. I generally work as a solo artist with input from select contributors and that’s how ESCAPE and the pending LP were created. For the rest of 2016 look for release of 4 music videos and possibly another EP towards the end of the year. What is the intended sound and image of “Precious Child”? How has that evolved? Great question. Fans have noticed that the image and sound has been changing, and they should expect it to continue to change. Evolution suggests growth from one state to another. However, I strive for tabula rasa when embarking on a new creative work. Tabula rasa and Shoshin AKA Beginner’s Mind; they are both concepts which basically revolve around starting fresh with an open and receptive mind. I find this essential to spontaneous, personally authentic creativity. Accordingly, fans should expect the sound and image to vary but Precious Child will always be emotionally intense music and art about personal transcendence and many roads by which transcendence can be realized. Understand that I draw my influences from what I experience as the most powerful parts of the world- shadows, starshine, pain, manic joy, the wilderness, sunrises, sunsets, and certain inescapable emotions. Being a little less abstract however, my intentions in sound and image are to provoke and evoke. My art in entirety is a story, with lots of little stories being told in the individual works. Just empty your mind and listen- I don’t make casual listening music. What is one characteristic about you that a lot of people might not know that you can share? I literally ate nothing but ramen for two years while I saved up money for my first album. Recording an album is expensive! Despite 2 years of a monochromatic diet, I still love ramen. Top Ramen, Oriental flavor. Intense, focused, deliberate, multicolored, passionate. How did you come to compose and produce music for the Neil Gaiman biopic Dream Dangerously? Did you get to meet him? A few years back, I met one of the producers for the film, Jordan Rennert through our mutual friend Laura Rubin. We all checked out the “Killer Heels” exhibit at the Brooklyn Museum and then grabbed some thai food. Over dinner I mentioned to Jordan that I was shooting the video for “I Fall” myself and that I had no idea what I was doing with regard to equipment. He kindly gave me some tips which I followed exactly and you can see for yourself that those were great tips. Jordan lives in LA and knowing my sonic vibe, tapped me on the shoulder to do some composing for the film. As for Neil, he’s a very busy guy- the books don’t write themselves and so I have not met him- yet. How does one go about scoring for a film vs. writing an industrial / rock album? Entirely different creative process. For my own albums as I mentioned before I start with a blank slate with my own influences and stories guiding the composition. For the film, I watched it a few times then lay down on my couch and started imagining. I do much of my composition in my head, trying out different themes and sounds and rhythms and textures. Then I literally watch the film while playing the music on the fly and then build on it. So the key difference is that for film I let my inspiration and creation be guided by the film so the music will support and enhance the picture. Music supporting the filmmakers vision as opposed to music exclusively for my vision. Do you plan to do film more scoring in the future? Yes, I really enjoy it. It’s wonderful to work towards someone else’s vision. I am very busy with Precious Child though and the schedules would have to work out. This film came at the right time when I was in the middle of writing demos and not recording or touring. Any tour plans coming up? Not for 2016. I have some one-off solo all electronic shows in California this fall but no touring until the concept album is recorded and released. When you’re preparing to perform live, do you need to psych up or calm down? How do you do it? Live. I’m most alive onstage. I sometimes thug out and listen to some gangster rap before a show to psych up but generally as soon as I walk onstage I’m alive and there. I always get nervous but I love that feeling. That feeling means that something important is about to happen, something meaningful and in the case of live performance, a wonderful experience- the communion with the crowd. Are there any new releases on the horizon that you can share with us? Got a music video for “Magic is Real” about to drop. Got another one for “To Need” right behind that. Then a video for “The Past” this fall and then behind that a video for a live favorite- “Just Another Day”. Depending on how recording for the concept album goes I might put out an EP before the end of the year which will include “Just Another Day” and some other tracks.